Find out what you can borrow, and for how long. 1. In person at the service desk. 2. Call the library at 1-617-587-5589 during service desk hours. 3. Log into your library borrowing account using the number on the barcode sticker on the back of your NECO ID card and your last name (lowercase). 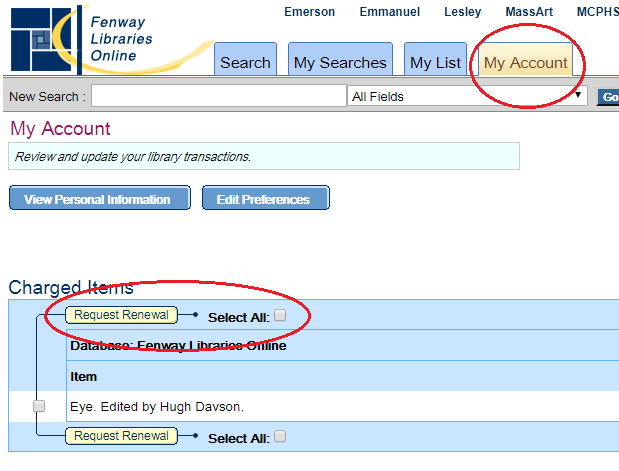 Select the "My Account" tab, check the "Select All" box, then click "Request Renewal."